Woods Peacock Engineering Consultants, Inc.
Tadjer Cohen Edelson Associates Inc. The Smithsonian Institute wanted the Grand Salon to be a “must see” destination, which required large interactive technology exhibits to be hung in the gallery. The trusses were engineered to carry 90,000lb of exhibition equipment in the vaulted ceiling room. 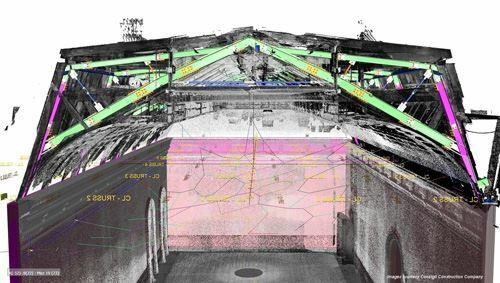 Field measurements and 3D laser scans of the attic space above the Grand Salon were used to sandwich in between the existing wood ceiling, roof timber framing and new mechanical equipment. 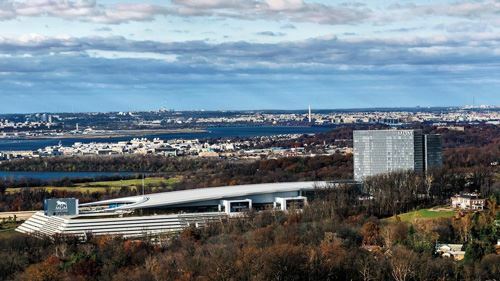 Capitol Crossing is one of the largest developments in the Washington Metro area. The project, creates three new city blocks right out of thin air, over an active highway. Deep concrete caissons were dug to support seven acres of highway decking. The project bridges two neighborhoods, Capitol Hill and the East End, together which were long separated by the I-395 Center Leg Freeway. 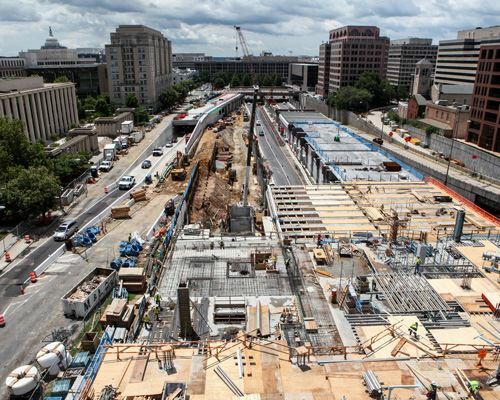 The judging committee was impressed by the large scale, yet pleasant, aesthetic, of the Capitol Crossing project. The unreal focus and dedication to eco-friendly, energy saving, water savvy techniques on this project should be used to set the bar for future construction in the United States. 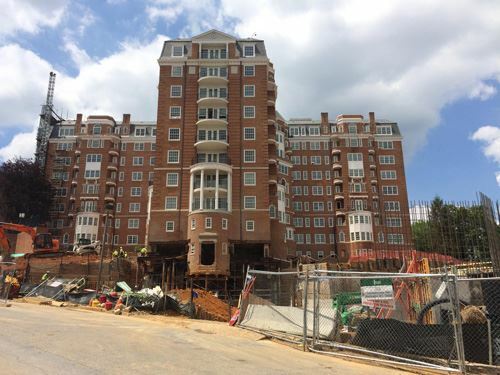 Wardman Tower & Garage consisted of three phases. First, underpinning and lowering the columns in the basement to allow for a 10’-0” ceiling. Column shoring was designed and built around each column, the existing lower portion of the column demolished, and then a new column cast in place at the lower elevation. Second, underpinning and shoring the southeast wing to additional stories below grade, to connect to a new two-story below grade parking structure. Lastly, the renovation of the existing tower condominium’s various slabs, openings, and updates to mechanical equipment and the penthouses. Long-needed repairs and modernizations were performed, a new penthouse was added above the existing roof, and a full floor was added below the original historic building footprint. In addition, several columns were removed on the first floor to create a new assembly area. This was done by building a truss into the corridor wall above, in order to transfer out the loads. An extensive seismic analysis was performed to ensure that the existing historic masonry façade would perform during a seismic event. The judges were impressed with the commitment to historic preservation, including going to great lengths to realize a full-story excavation beneath a historically sensitive building. The judging panel was impressed by the sophisticated performance-based analysis performed to evaluate the contribution of the existing masonry to the lateral resistance of the building and to limit damage to the historic under the seismic forces. 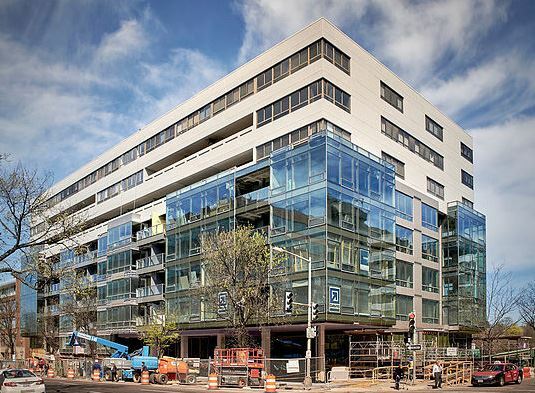 Originally constructed in 1979, 2501 M Street was designed as a cast-in-place concrete mixed-use office and apartment building with 2 floors of below grade parking, all skinned with a precast facade. New ownership wished to redevelop the property into a luxury residential building. 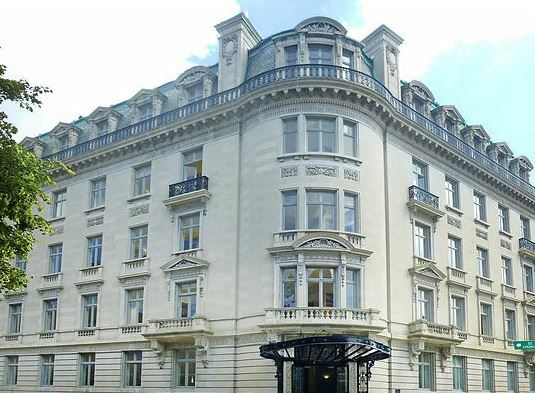 This project consisted of renovation, rehabilitation, and expansion of 8 out of 11 floors, the main roof of the building, and the elevators, all while the upper 3 floors of the building are fully occupied by private residences. 3D scanning of each floor was used to properly coordinate, design, and mitigate any clashes detected. This project impressed the judges through its engineering creativity to solve challenges imposed by the existing structure. These challenges were overcome via sophisticated gravity and lateral designs to resolve the conflicts between the existing mild reinforced concrete structure and the traditional structural steel addition. Further unique design solutions included HSS slab extensions, fiber reinforced polymer (FRP) strengthening, and revised load paths where existing members were altered or removed. 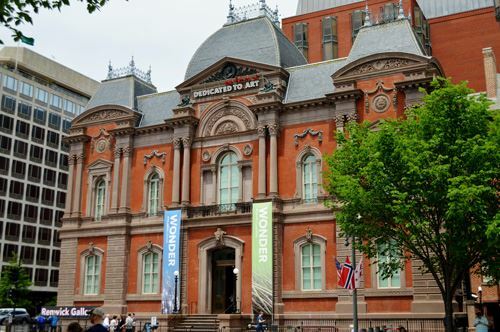 Constructed in 1859, the National Historic Landmark Renwick Gallery is a branch of the Smithsonian American Art Museum. In need of major renovation and modernization, Woods Peacock was hired to address the failing infrastructure, including roof, façade, accessibility, and anti-terrorism improvements. Krieger Hall is a six-story building constructed in 1929. Krieger Hall connects to Ames Hall by an open-air marble colonnade structure. Prior to renovation, Krieger Hall and the colonnade suffered chronic below-grade leakage, poor overall drainage in the building’s vicinity, stone deterioration, and other issues requiring remedial work. 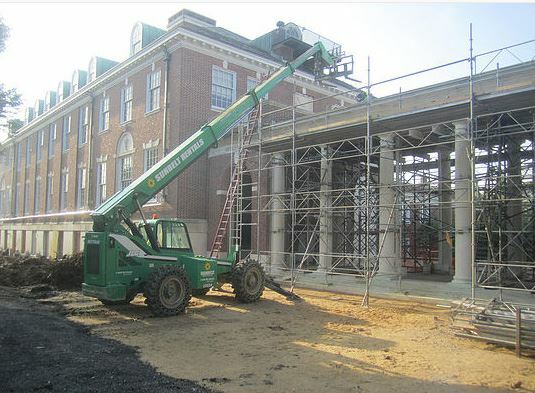 The restoration included regrading and reconfiguring the courtyard, installing below-grade waterproofing and drainage, and introducing new waterproofing and flashing components with the masonry construction. The marble colonnade connecting both buildings was completely removed and reconstructed. 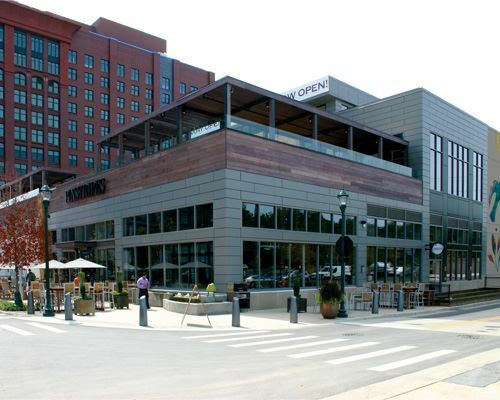 Reston Station Building OB1 is a new mixed-use building. 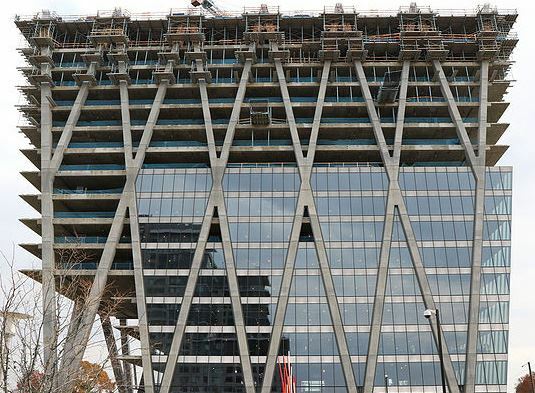 Visible to the thousands of people who travel to Dulles International Airport each day, this striking project consists of a 15-story office tower showcasing a unique lateral system consisting of a diagonalized, exposed concrete exoskeleton. The building also includes eight levels of below-grade parking. Known as the “up-side-down” building, tree-columns fan out to support an overhang over the adjacent five-story open-air plaza. Pier 4, was originally constructed in the mid-1940’s from a cast-in-place concrete pier extending into the Washington Channel. The pier originally supported a one-story concrete structure and canopy. During construction, it was converted into a three-story office building, integrating new steel framing structure into and on top of the existing structure. Design challenges included developing a lateral resisting system that did not overload the existing concrete pier or the existing wood piles. The judges were impressed by the strategic selection of a combined lateral system to distribute the seismic and wind forces across the pier to eliminate the need for pier reinforcement. 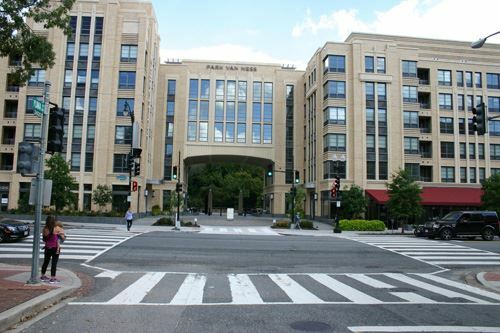 Park Van Ness is a 272-unit residential building with ground floor retail. The structure has six above grade residential and five below grade floors of residential and parking. The rear of the property overlooks Rock Creek Park. It features an art-deco façade, and the building also sports a porte-cochère at the center of the site using a bridge that spans 65’-0”. Three column lines supporting three levels above are transferred out to support the bridge. 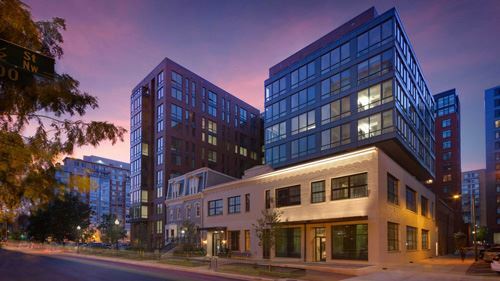 455 I Street is a mixed-use building constructed above, through, and adjacent to a historic, two-story, commercial building and two attached, historic four-story row houses. Standing at eleven stories above grade and four stories below grade, the top ten levels of the building are residential apartments with a rooftop terrace and pool while a portion of level one is dedicated to retail, and apartment amenities. The complicated intricacies of the project included extending columns up through the existing historic commercial building, removing existing roofs, re-attaching existing walls, and reframing the historic wood row houses. The design team’s successful solutions to the challenge to retain and re-use portions of the existing historic buildings, and to construct above and adjacent to those buildings led to this project’s selection for award. MGM National Harbor is a new resort and entertainment destination within the National Harbor Development. 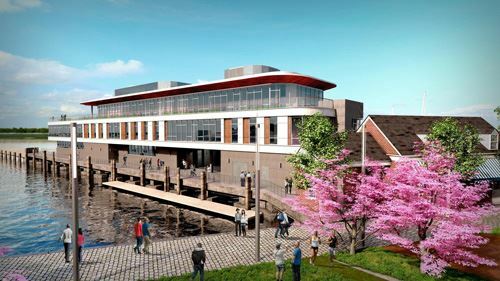 The project includes over 3 million square feet of gaming area, performance theaters, restaurants, outdoor amenity decks, and a luxury hotel and spa.. The masterful piece of work includes 60’-0” spans in the upper levels, a façade that slopes at 45 degrees, a large curved roof with elevation changes of over 40’-0”, 60’-0” cantilevers, a floating skylight element and large interior and exterior transition spaces. The judges were impressed with the design team’s contributions and attention to budget and value created was a highlight. The most impressive design features included the 7-story sloping façade, the signature sloping roof, and the dramatic atrium area which is pierced by the hotel tower structure. 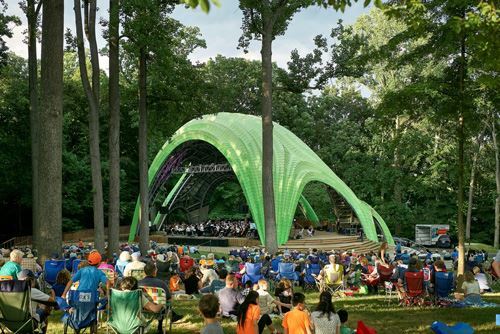 The Chrysalis, a new outdoor amphitheater in Merriweather Park at Symphony Woods, has three distinct design goals: a Sculpture ; a Pavilion for events; and a Stage –framed by a proscenium arch and enclosed with a frame capable of supporting 40,000 lbs of hung theatrical equipment. The steel frame is doubly-curved and follows the peaks and troughs of the Chrysalis’ distinctive, pleated, cladding. The frame is composed of 12 unique, warped arches or “spines”. The judges were impressed with the Chrysalis’s three distinct design features: a Sculpture, a Pavilion, and a Stage. These three design features were magically achieved through the team’s ability to evolve its design into a cost-efficient, structurally elegant, easy to construct masterpiece.